We all remember that first magical moment we put on mascara. The stingy, sticky mess we made as we pasted our lashes to our eyelids with the slightly smelly black goo. How proud we were when we finally figured out how to do it right. It was almost exclusively the first makeup experience many of us had, or at least the most memorable. And whether or not we ditched the mascara for an alternative method, our lashes are still a crucial part of our makeup routine. As it should be! The eyes are the window to your soul after all. So whether you’re a mascara junkie, an all-natural, or an extension pro, we’re going to talk about all the newest trends in the lash world. Maybe you’re not about that makeup life and just want your lashes to be the healthiest they can be. When it comes to this arena, Castor oil is a great addition to your daily routine. 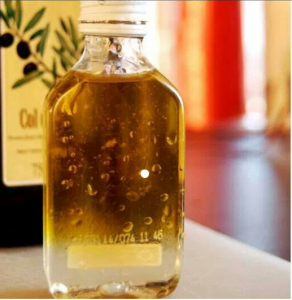 The oil is the perfect match for the thin, fine hair of your lashes because of its ability to be absorbed. The oil not only hydrates, but strengthens your lash at its core so they can grow longer and even thicker. Don’t worry, it’s not as messy as it sounds! We suggest using a clean spoolie brush (maybe from your friendly local brow specialist ) to coat lightly with Castor oil from the dropper. 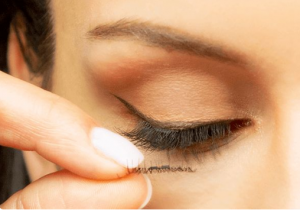 Roll it on a paper towel to get off any big drops and brush your lashes lightly. You don’t need a thick coat; a little goes a long way! And this isn’t just for the all-natural chicks; it’s a great way to support lash growth as a sleeping mask! Don’t be surprised if you haven’t heard of this treatment as it’s still relatively new to the scene, but it may very well be your new best friend. 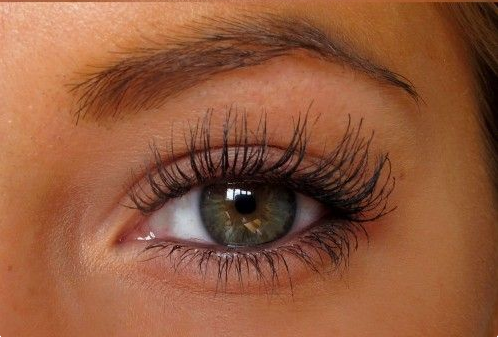 The treatment gives you the look of just curled lashes with a coat of mascara, but the kicker is… it lasts 6-8 weeks. No more curling your lashes everyday, or worrying about your lighter lashes poking through your mascara. Most people can ditch the curler/mascara duo altogether, as the effect is so noticeable, but if you want to add mascara on top there’s no reason you can’t. So what’s the procedure? A small amount of perm solution is applied to your lashes just above the lash line, creating the “curl” effect at the base of your lashes right where the curler would. The tint is a dark dye applied to the entire lash, essentially dying them the say way you would hair. 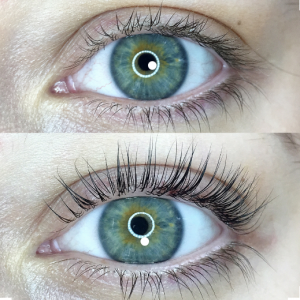 The combination of lift and tint create a noticeable change to even the shortest natural lashes, and the results really do last. Research is key here! You want to make sure you’re getting a skilled, experienced technician doing your treatment, as a lot of salons are adding this service without proper training or certification just because it’s trending. But in good hands, this treatment can save you a ton of time and energy perfecting your lashes every morning! Applying your own false lash set can be a daunting task. If the idea of applying glue to your eyelid, or having to peel them off at the end of the day seems like to much to you, magnetic lashes may be your best bet. These guys have only just started to get popular, due to their ease of application and light nature. Each lash piece has a “micro magnet” attached to its binding and a partner magnet that goes under your lash line. The lash piece goes on top of your natural lashes, making a “sandwich” between the two magnets. They boast no damage to your natural lashes, and you won’t have to worry about applying glue or your skin getting irritated by the adhesive strips. It may take a little practice, but magnetic lashes can cut down the application process to seconds, as opposed to struggling with the perfect placement for minutes on end. And if you’re thinking they’ll be heavy, the majority of people who have used them say they forgot they were even wearing them. So if you’ve been curious about falsies for a while but got cold feet about the adhesive aspect of wearing them, there may finally be a solution for you! The beauty industry is constantly evolving, and these are just a few of the new trends on the market. As with anything new, be sure to do your research to find what’s best for you and your individual skin type. 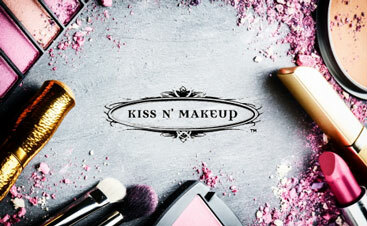 We hope you bat a lash for us at Kiss N’ Makeup this fall!